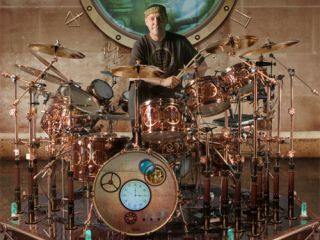 As if Alex Lifeson's modified Hughes & Kettner guitar rig wasn't steampunk enough, as previously reported, Neil Peart's drum kit has been equally Victorianised for Rush's 2010 Time Machine tour. The set-up includes customised Sabian cymbals, DW shells and copper pipe-like DW hardware. Don a monocle and check out the Pearl forum for more detailed kit shots, and hit-up Pro-Mark for a slide show of pictures from Rush's opening Time Machine show in Albuquerque last week. Magnificent.